We’d love your help. Let us know what’s wrong with this preview of Breathing Lessons by Anne Tyler. To ask other readers questions about Breathing Lessons, please sign up. I finished reading Anne Tyler’s Breathing Lessons a week ago, but I found myself thinking about it a lot, especially during the recent holidays. Tyler’s specialty is family and marriage, and while sitting down to countless meals, chatting with parents, siblings, in-laws, nieces, nephews, extended relatives and seeing little grievances and grudges pop up and then be gently patted back down, hearing current events be analyzed in smart or odd or even offensive ways, seeing patterns (some good, some I finished reading Anne Tyler’s Breathing Lessons a week ago, but I found myself thinking about it a lot, especially during the recent holidays. Tyler’s specialty is family and marriage, and while sitting down to countless meals, chatting with parents, siblings, in-laws, nieces, nephews, extended relatives and seeing little grievances and grudges pop up and then be gently patted back down, hearing current events be analyzed in smart or odd or even offensive ways, seeing patterns (some good, some regretful) emerge among family members… I realized how well the author knows people. On the surface, Breathing Lessons, which won the Pulitzer Prize for fiction in 1988, seems like such a simple tale. Set during a single day, it tells the story of Maggie and Ira Moran, a middle-aged Baltimore couple who set out one morning to attend the funeral of the husband of Maggie’s best friend, Serena, in Deer Lick, Pennsylvania, 90 miles away. Maggie, who’s got an (over)active imagination, also gets it into her head to visit Fiona, her ex-daughter-in-law, and her grandchild. She secretly wants Fiona and her son Jesse to get back together again. She thinks, rightly or wrongly, that they still love each other, and that their constant skirmishes and their pride have kept them apart. That’s the story – “in a nutshell,” as one of Tyler’s characters might say. But that’s certainly not the book. Tyler is so good at adding texture and incident to characters, so their lives feel rich and real. The way Maggie and Ira initially get together is surprising but feels right. Ira’s early home life – he oversees his father’s frame shop and helps support his two sisters – will change how you feel about him later on when he might seem like a smug, cold, solitaire-playing curmudgeon. Some of the book’s early sequences are just stand-alone brilliant. At the funeral, Serena demands that everyone who sang at her wedding sing the same song at her husband’s funeral. The mourners are mortified, but someone comes through with a lovely gesture. And another sequence, a lengthy one set on a highway, gives you a glimpse at a relationship that’s lasted even longer than Ira and Maggie’s. This whole section demonstrates what Tyler does so well: mix straight on observation with comedy and a streak of melancholy, all written in a recognizable, middle-American vernacular. The gentle and often not-so-gentle bickering between Tyler’s characters reminded me of the banter between my father (taciturn, solitary) and my late mother (gregarious, always chatty with strangers, scattered, well-meaning). Tyler has affection for her characters, however flawed, and she understands the small and big mistakes and compromises they’ve made on the road of life. Don't be surprised if you start questioning whether Maggie did the right thing at a critical moment in Fiona's (and Jesse's) life. This is the second novel by Anne Tyler that I read and I'm happy to say I enjoyed it much more than The Vinegar Girl. - the main characters, Ira and Maggie Moran, were very relatable and recognisable. Maggie is a busybody, helpful, chatty, well-meaning, a bit scattered at times. She's constantly fretting over her kids and the grandchild she doesn't get to see anymore. She wants to help and fix people's relationships. Ira is the "level-headed" one, a bit taciturn, serious, almo This is the second novel by Anne Tyler that I read and I'm happy to say I enjoyed it much more than The Vinegar Girl. - the main characters, Ira and Maggie Moran, were very relatable and recognisable. Maggie is a busybody, helpful, chatty, well-meaning, a bit scattered at times. She's constantly fretting over her kids and the grandchild she doesn't get to see anymore. She wants to help and fix people's relationships. Ira is the "level-headed" one, a bit taciturn, serious, almost permanently annoyed with his wife's chattering, interference, and small manipulations (and he's not even aware of half of them). That old adage "familiarity breeds contempt" is plenty apparent. - the Morans squabble and get annoyed with each other; they misunderstand each other, jump to conclusions, see things differently. - the main themes of marriage, raising children, expectations/dreams vs reality are very well done. - there's humour, there's mundanity, but most importantly, the characterizations are excellent. Breathing Lessons is about a couple, Maggie and Ira, who has been married for 28 years. Their son, Jesse, a father of a toddler, is facing a divorce. Their teenage daughter, Daisy is about to enter college so their house is now an empty nest. Life is a journey and, for a spouse like me, marriage is that part of the journey where you are somebody paddling the boat with you. My daughter is also heading to college a couple of months from now. Although she will be still be staying with us, I know tha Breathing Lessons is about a couple, Maggie and Ira, who has been married for 28 years. Their son, Jesse, a father of a toddler, is facing a divorce. Their teenage daughter, Daisy is about to enter college so their house is now an empty nest. Life is a journey and, for a spouse like me, marriage is that part of the journey where you are somebody paddling the boat with you. My daughter is also heading to college a couple of months from now. Although she will be still be staying with us, I know that time will come that she has to be all by herself so she’ll learn to stand on her own feet. Seeing her all grown up receiving her high-school diploma just the other day made me reflect how time really flew. She used to be a 6-y/o toddler tightly holding my hand on her first day at that school eleven years ago. This morning, I looked at myself in the mirror and wondered where that young father has gone. You can say that this theme is nothing new. However, Anne Tyler writes like no other. She can make everything interesting to prod you to keep on turning the pages until you’re done. (1) The whole marriage of Maggie and Ira is encapsulated in one day. From the time they leave Baltimore to the funeral of Serena’s (Maggie’s best friend) husband to their way back to home. On the way back, they meet all sorts of people that can make you reflect on how your own marriage is currently going. For me, this made me realize how communication is important. I know how is this as a big factor in any relationship but it is not always about listening full ears or talking about how I feel to my wife but also when to keep quiet and ignore the unnecessary. Come to think of it, there is really no sure-fire hit about communication in a relationship, right? It all boils down, I think, to how much understanding we are in tolerating each other’s shortcomings. (2) I’ve read and liked her two other non-Pulitzer winners prior to this book. In fact, I read all these three books in succession. I first started with The Accidental Tourist because it is both a 501 and a 1001 book. Unbelievably brilliant: Macon Leary stayed in my mind for few days and even up to now I still remember him in his cast. Then I followed it right away with Dinner at the Homesick Restaurant because my Goodreads friend said that it is her favorite among Tyler’s works. That’s true! The blind Pearl Tull stayed as a prominent image in my brain for some days after. It made me appreciate my mother more that I called her up a day after I’ve finished reading the book. Both books engaged me from page 1 and made me continue reading the book almost without letup. Breathing Lessons is structured differently. The start is not engaging because it is just about a radio program announcing that Maggie’s daughter-in-law Fiona is getting married again then Maggie hits a truck on her way out from the service shop. But the climax builds gradually like that of the movie Thelma and Louise as in turns into something like a travelogue and like the Little Prince meeting all sorts of people on the road. It is just different from the first two books and I admire Anne Tyler more because she does not stick to one structure or one formula. There are those recurring characters or events like the incorporation of songs or that minor character who sleep walk that reminded me of Ezra Tull in Dinner at the Homesick Restaurant. But aside from those, everything is new and if you cover Anne Tyler’s name on front of the book, Breathing Lessons could have been written by any other brilliant female American author. So why Breathing Lessons? There are instances when Tyler made references to breathing but no direct answer. I think that it is for those who leave relationship for the reason that they could not breath. Ira Mason, the husband, feels that he should have married Anne Landers but he chose to marry and stick with Maggie. For 28 years, he could have felt that it was a mistake but he stayed. He thought, I know he must have thought, of leaving but he stayed. Why? Anne Tyler knows and they are the lessons that she will make you reflect on while reading this book. Did they really give her the Pulitzer for this thing?! How utterly appalling! This may qualify as the stupidest book I have ever read. I did not like even one of the characters. Not one! They were annoying and weak and petty. I really wanted to hurl Maggie from the highest bridge just to get her to SHUT UP! Dumb dumb dumb dumb story. Shouldn't have bothered to finish it, but I did. So...more fool me. I bought this book in college, right after it won the Pulitzer in 1989. I started it and thought. . . yeah, like I really want to read about an old married couple, fighting in their car. I not only did NOT continue to read it, I sold it at a used book store. But, there it was again last month, mine for a quarter at an estate sale. I reminded myself that it HAD won a Pulitzer, and I was determined to read it this time. I still struggled with the first 25 pages. And, even though I realized the "old I bought this book in college, right after it won the Pulitzer in 1989. I started it and thought. . . yeah, like I really want to read about an old married couple, fighting in their car. I not only did NOT continue to read it, I sold it at a used book store. I still struggled with the first 25 pages. And, even though I realized the "old couple" was no longer old in comparison (no, now they're just in their 40s, like me), they were initially boring to me, all over again. I pushed on, and I'm glad I did. This novel is almost all dialogue, with a viable, well-written story and ridiculously believable characters. It's laugh-out-loud funny at times, and incredibly poignant at others. Una divertida, conmovedora y, a veces, irritante historia sobre un matrimonio corriente en su vida corriente. Una historia que va surgiendo de los recuerdos y vivencias que marido y mujer tienen, no siempre coincidentes, a lo largo de un largo día; uno de esos matrimonios que sobreviven con una inquebrantable mala salud de hierro gracias y a pesar de Ira y, sobre todo, de Maggie, personaje central y magistral de una novela que Anne Tyler escribió en estado de gracia y que mereció el premio Pulit Una divertida, conmovedora y, a veces, irritante historia sobre un matrimonio corriente en su vida corriente. Una historia que va surgiendo de los recuerdos y vivencias que marido y mujer tienen, no siempre coincidentes, a lo largo de un largo día; uno de esos matrimonios que sobreviven con una inquebrantable mala salud de hierro gracias y a pesar de Ira y, sobre todo, de Maggie, personaje central y magistral de una novela que Anne Tyler escribió en estado de gracia y que mereció el premio Pulitzer de 1989. Todo es engañosamente pequeño aquí, no hay grandes tragedias ni grandes problemas existenciales, ni grandes mentiras ni grandes traiciones, ni grandes héroes ni grandes mártires, solo defectos y virtudes corrientes danzando de un lado para otro en coreografías que todos conocemos y puestas en escena con una naturalidad exquisita, con un ritmo preciso, con un sentido del humor compasivo y con una finura y una lucidez para resaltar el detalle preciso realmente admirable. Maggie, torpe, peliculera, impúdicamente comunicativa con los extraños, impulsiva, cabezona, propensa a los accidentes y a los malentendidos, está en pleno síndrome del nido vacío y utilizará su patológica inclinación a inmiscuirse en la vida de los demás para solucionarlo. Alérgica a toda situación que no encaje en sus fantasías sobre su vida y la de todos aquellos que la rodean no tiene escrúpulo alguno en manipular a quién haga falta en pos de sus objetivos ocultos, aunque siempre de buena fe y con resultados casi siempre desastrosos. Una característica de Maggie que le es especialmente irritante a su marido Ira que no puede impedir repentinos ataques de sinceridad que acaban por complicar aún más las cosas. "¿No crees que ahora ya debería saber cómo respirar?" Una lógica pregunta de una embarazada en su preparación al parto. Una pregunta que es el título de la obra y cuya interpretación puede ir desde la referencia a todas aquellas cosas importantes para las que no nos preparan mientras nos saturan con un sinfín de conocimientos inútiles, hasta el hecho de que las cosas más sencillas son las que siempre acabamos complicando cayendo en los mismos errores una y otra vez o lo fácil que es olvidar hasta lo más simple cuando nos encontramos bajo presión. Es inevitable, como una maldición, siempre nos serán necesarios los ejercicios respiratorios. When reviewing books with others--whether in text-based or face to face discussions--I am always irritated when readers don't like a book because they "don't like" certain characters in the book. I want to remind them that a) these people are, umm, fictional and b) a diverse mix of characters drives a story, makes it interesting. The truly gifted author fashions characters with weaknesses and flaws as well as strengths and charming bits--the fun is in watching the interplay. When a reader doesn' When reviewing books with others--whether in text-based or face to face discussions--I am always irritated when readers don't like a book because they "don't like" certain characters in the book. I want to remind them that a) these people are, umm, fictional and b) a diverse mix of characters drives a story, makes it interesting. The truly gifted author fashions characters with weaknesses and flaws as well as strengths and charming bits--the fun is in watching the interplay. When a reader doesn't like a protagonist because she's "too whiny," or can't find sympathetic traits or reasons why the bad guy acts as he does--or worse, proposes changes for a character's personality to make the story "better"-- I tend to disregard the reader, as someone who wants to read the same story, with the same stock characters, over and over. And now--I'm going to be that person. Although I love Anne Tyler's work--thought "Accidental Tourist" was genius, and cried through "Coming to America"--the main character in this book was like fingernails on chalkboard, as I was reading Tyler's lovely, lucid writing. Maggie was the embodiment of all I dislike in women, real life or on the fictional page: completely self-deluded, sanctimonious, annoying, self-involved, wheedling, deceptive--all the while believing she was doing the right thing, talking sweetly. The thing is, I know women like Maggie--often women of an older generation, bewildered by the pace of societal change, fretful but unwilling to adapt, stuck in a set of values and loyalties that just don't work any more. Not bad people, but clueless. From the book jacket: Everyone knows a couple like the Morans. Maggie, with her scatterbrained ways and her just slightly irritating – but good-hearted – attempts to make everything right for everyone.... And Ira, infinitely patient, who is addicted to solitaire and who whistles out popular tunes, the only barometer of his moods. They’ve learned all there is to know about each other ... two ordinary lives in a comfortably routine marriage. But on the road to a friend’s funeral, they make some un From the book jacket: Everyone knows a couple like the Morans. Maggie, with her scatterbrained ways and her just slightly irritating – but good-hearted – attempts to make everything right for everyone.... And Ira, infinitely patient, who is addicted to solitaire and who whistles out popular tunes, the only barometer of his moods. They’ve learned all there is to know about each other ... two ordinary lives in a comfortably routine marriage. But on the road to a friend’s funeral, they make some unexpected detours – and discover how extraordinary their ordinary lives really are. ..
I’ve had this on my TBR for ages, and just never got to it. I wish I hadn’t waited so long, but then again, maybe my own years of marriage help me better understand Maggie and Ira’s relationship – with each other, with their children, parents, co-workers, neighbors and friends. I love the way Tyler reveals her characters to the reader. Their actions – small and large – and statements show the reader who these people are. Their hopes, dreams, frustrations, and regrets become evident over the course of the novel. I am irritated by Maggie, and yet I love her. Who doesn’t want things to work out, to see his child happy, or her spouse succeed? Who doesn’t appreciate those small tokens of affection, or get irritated by another person’s unconscious habit? I want to shake Ira, and yet I love his patient forebearance, and that he still tries to please Maggie. Some years ago a young teen who had just read Shakespeare’s Romeo and Juliet asked me, “Do you think you can fall in love at fourteen?” My answer: “Falling in love is easy. Loving someone is more challenging … especially when he can’t find the dishwasher though it’s right there under the counter where he leaves the dirty dishes.” Ira and Maggie have learned to look past “the dishes” and love one another anyway. And I love them. Their lives may be ordinary; the novel is anything but. Having read 'Breathing Lessons' by Anne Tyler, for which she won the Pulitzer Prize in 1989, I am once again reminded of her extraordinary insight into the inner workings of marriage and family. In this story, we are introduced to Ira and Maggie Moran, a couple married for 28 years who have two grown children.... Jesse, a son who appears to be drifting and stuck in unrealistic fantasies of rock stardom, with a failed marriage behind him and a young daughter with whom he has no relationship; and Having read 'Breathing Lessons' by Anne Tyler, for which she won the Pulitzer Prize in 1989, I am once again reminded of her extraordinary insight into the inner workings of marriage and family. In this story, we are introduced to Ira and Maggie Moran, a couple married for 28 years who have two grown children.... Jesse, a son who appears to be drifting and stuck in unrealistic fantasies of rock stardom, with a failed marriage behind him and a young daughter with whom he has no relationship; and Daisy, their overachieving daughter about to enter college but despite her intelligence, she seems to be anxious, hypercritical and derives little pleasure from her life. This book is unusual in that the entire story takes place over the course of just one day.... but in that day, we are given access to a lifetime of memories from Ira and Maggie's lives. The story begins with a 90-mile road trip. Ira and Maggie are on their way from their home in Baltimore to the funeral of Maggie's oldest friend, Serena's husband, in Deer Lick, Pennsylvania. If you have ever taken a lengthy car trip with anyone, you will appreciate the atmosphere and the dynamics of Ira and Maggie alone in a car for a couple of hours... time alone enclosed in a small space. Tensions rise and old conflicts rear their heads and that time can tell you a great deal about the relationship between the people sharing that space. We learn much about Ira and Maggie's marriage on this car trip. Because each retreats to their own thoughts and memories, we learn how Ira and Maggie met and we learn of their early years together. We learn about them as individuals and how they relate to each other as a couple. Most importantly, I suppose, we learn about that 'difficult to describe' dynamic which sometimes occurs in a long marriage which makes the relationship, despite its difficulties, warm and comfortable. If you have read any of Anne Tyler's novels, then you are already aware that the characters she creates are not always likable. In fact, they are often annoying and exasperating... Maggie and Ira certainly have their moments. Ira frequently disengages from emotional or otherwise intimate situations, choosing instead to play endless games of solitaire rather than discussing his feelings. And Maggie... well, she OVER shares HER feelings and other personal details of her life with anyone who appears open to listening... even complete strangers. She also seems to have made it her life's mission to meddle in the lives of those she loves...convinced that she knows what will make them happy and if she just helps them along a little, they will finally attain their hearts' desire... whether these loved ones actually WANT her help or not. As Ira said, with uncharacteristic insight.... "She thinks the people she loves are better than they really are, and so then she starts changing things around to suit her view of them." There WAS an aspect of this story which held a great deal of appeal for me. There was an obvious correlation made between music and memory. This story is all about memories... Ira and Maggie's memories and music was the catalyst for many of their most cherished memories as a couple. At one point in the story, their thoughts about the songs they had sung at a friend's wedding decades before brought sweet memories to them of the earliest days of their romance. Although the songs mentioned over and over in this story... 'Love is a Many Splendored Thing' and 'True Love' were a bit before MY time, I could relate to the idea that music can and does evoke very powerful memories for people. Hearing songs from the 'soundtrack' of my own life can instantly transport me to a specific place and time. This novel is a day in the life Maggie and Ira Moran, who have been married for 28 years. They start the day by attending a friend’s funeral and end it by dealing with the consequences of Maggie’s unstoppable impulse to involve herself in other peoples’ lives. Although the action of the novel is contained within that one day, the narrative explores the relationship between Maggie and Ira as they reflect upon their lives and their marriage. Tyler is immensely skilled at creating memorable characters. In this novel, as in many of her others, her main protagonists are somewhat flawed and very real. Although I don’t think I’m like Maggie or Ira – or at least, I hope I’m not like them - as someone who has been married to the same person for thirty-five years, I identified with some of their dilemmas. Moreover, the account of their relationship made me reflect on my own relationship. The novel moved me to laughter and to tears, which are the reactions I’ve come to expect in response to Tyler’s wonderful writing. This book has sat on my bookshelf for the best part of twenty years. I thought I was embarking on a re-read, but once I started it became obvious that I hadn’t read it before. It was great to discover a “new” Anne Tyler novel. While it didn’t move me in the same way as The Accidental Tourist moves me, reading Breathing Lessons was an emotional journey, which I enjoyed sharing with my friend Jemidar. Anne Tyler is an amazing writer and this novel is a worthy winner of the Pulitzer Prize. 4.5 stars, but only because I prefer The Accidental Tourist. (3.5) Tyler won the Pulitzer Prize for this one. I’d rate it third out of the seven of her novels I’ve read so far, after Dinner at the Homesick Restaurant and The Accidental Tourist. (In general I seem to like her 1980s work the best.) The main action takes place all on one day, as Maggie Moran and her husband Ira travel from Baltimore up to Pennsylvania to attend the funeral of her childhood friend’s husband and pay a visit to their son’s ex-wife and their granddaughter. Of course, circadian na (3.5) Tyler won the Pulitzer Prize for this one. I’d rate it third out of the seven of her novels I’ve read so far, after Dinner at the Homesick Restaurant and The Accidental Tourist. (In general I seem to like her 1980s work the best.) The main action takes place all on one day, as Maggie Moran and her husband Ira travel from Baltimore up to Pennsylvania to attend the funeral of her childhood friend’s husband and pay a visit to their son’s ex-wife and their granddaughter. Of course, circadian narratives are so clever because they manage to interleave sufficient flashbacks to fill in the background. So we learn how 48-year-old Maggie – a precursor of Rebecca Davitch from Back When We Were Grown-ups and Abby Whitshank from A Spool of Blue Thread and the epitome of the exuberant, slightly ditzy, do-gooding heroine – has always meant well but through a combination of misunderstandings and fibs has botched things. She settled on Ira almost out of embarrassment: she’d heard a rumor he’d been killed in military training and sent his father an effusive condolence letter. When their son Jesse got Fiona pregnant, Maggie convinced Fiona to give him a chance based on a sentimental story about him that she perhaps half believed, and now, years later, she’s trying to do the same. I loved the funeral scene itself – Serena is determined to recreate her wedding to Max, note for note – but I wearied of a sequence in which Maggie and Ira help an older African-American gentleman with car trouble. This is very much the Maggie show, so your reaction to the novel will largely depend on how well you’re able to tolerate her irksome habits. (Really, does she have to confuse the brake and the accelerator TWICE in one day?) Ira is the usual Tylerian standoffish husband, and Jesse the standard layabout progeny. What I found strangest was how little Tyler bothers to develop the character of the Moran daughter, Daisy. I needed something to read until the book I *really* want to read arrived in the mail, so I grabbed this old Anne Tyler off the shelf. I used to read Tyler a lot; I loved "The Accidental Tourist", liked "Saint Maybe" and "A Patchwork Planet", found "Celestial Navigation" almost unbearably sad, and had read eight of her novels all told. Perhaps my tastes have changed, or I simply reached my limit. Maybe what I found endearing twenty-five years ago just annoys me now. In any event, "Breathing Less I needed something to read until the book I *really* want to read arrived in the mail, so I grabbed this old Anne Tyler off the shelf. I used to read Tyler a lot; I loved "The Accidental Tourist", liked "Saint Maybe" and "A Patchwork Planet", found "Celestial Navigation" almost unbearably sad, and had read eight of her novels all told. Perhaps my tastes have changed, or I simply reached my limit. Maybe what I found endearing twenty-five years ago just annoys me now. 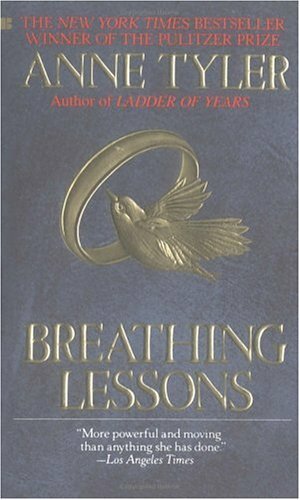 In any event, "Breathing Lessons", which won a Pulitzer Prize, just irritated me. For one thing, even bearing in mind that the book came out in 1988, it all seemed more like it took place in the early sixties or something. The main characters, a married couple named Maggie and Ira, seemed OLD. They open the book by traveling to the funeral of Maggie's friend's husband, and the friend basically has everyone re-enact her wedding day by singing a bunch of pre-Elvis pop songs. Yes, at a funeral. I'm telling you, these characters practically trip over themselves in their zeal to be "quirky". For this reason, none of them seemed real to me. They seemed like characters assigned an array of quirky but not very appealing behaviors. Ira ("Ira"? Really? Is anyone under eighty actually named "Ira"?) is a stock husband character who is designated as the sensible one, and yet he lets his scatterbrained, meddlesome wife Maggie call all the shots while he stands around griping and making faces but doing as he's told all the same. Maggie, for her part, seems to be devoting her life to trying to run and fool with the lives of her son and his ex-wife. She lies, manipulates, denies, exaggerates and pretty much sticks her Pinocchio nose in at every turn, and that's the main action in the novel. Maggie playing bird-brained puppeteer to a crew of characters who don't apparently have the spine to tell her no. She isn't even an interesting anti-hero because she's too silly to be that. Why did I even bother with this one? Perhaps because I thought the cover looked nice and dreamy. Birds - check. Infinity sign - check. A couple taking a roadtrip that allows them to view each other in a new light - check. All of it misleading. Remind me to not go for covers (which I think I will regardless). I think I am not really the demographic this book is intended for, but boy was this a tough read. Somewhere around the middle, I actually skimmed through a couple-forty pages and still the pl Why did I even bother with this one? Perhaps because I thought the cover looked nice and dreamy. Birds - check. Infinity sign - check. A couple taking a roadtrip that allows them to view each other in a new light - check. All of it misleading. Remind me to not go for covers (which I think I will regardless). I think I am not really the demographic this book is intended for, but boy was this a tough read. Somewhere around the middle, I actually skimmed through a couple-forty pages and still the plot had gone nowhere; the lengthy dialogue and meaningless supermarket trip added nothing. Finished the book and nothing had really changed, nothing resolved, no annoying habits forsaken. Perhaps my annoyance stems from the fact that I actually disliked the main protagonist. When that happens in a book, I know it's usually downhill from there. Most of the woman's thought process and constant meddling gave me a headache. Điều kỳ diệu trong những cuốn tiểu thuyết của Anne Tyler có lẽ đó là sự bình thường, một sự bình thường quá đỗi thân thuộc mà bà biết cách biến những nhân vật của mình chân thật, gần gũi trong một câu chuyện giản dị, ấm áp, không quá nhiều biến cố nhưng vẫn rất đặc biệt theo cách của riêng bà. Bà đặc biệt xoáy sâu vào mối quan hệ trong những gia đình bình thường, bà hiểu được những tình cảm và rối rắm ẩn bên trong sự êm đềm. Không chọn những chủ đề đao to búa lớn nhưng cách viết của bà vẫn có sức Điều kỳ diệu trong những cuốn tiểu thuyết của Anne Tyler có lẽ đó là sự bình thường, một sự bình thường quá đỗi thân thuộc mà bà biết cách biến những nhân vật của mình chân thật, gần gũi trong một câu chuyện giản dị, ấm áp, không quá nhiều biến cố nhưng vẫn rất đặc biệt theo cách của riêng bà. Bà đặc biệt xoáy sâu vào mối quan hệ trong những gia đình bình thường, bà hiểu được những tình cảm và rối rắm ẩn bên trong sự êm đềm. Không chọn những chủ đề đao to búa lớn nhưng cách viết của bà vẫn có sức ảnh hưởng và lay động một cách kỳ lạ. My first Anne Tyler and so absolutely blank about her style. Well, I am totally loving her characterization and plot layout. You learn about the characters as the day progresses, and nothing seems to be like what you first thought it to be. There is a humor that pervades the story the same way certain thoughts or emotions tickle up tears. This is reality written the best way ever, very realistic and relatable. It sort of came to me at a right time to evaluate self, relationships and parenting. A My first Anne Tyler and so absolutely blank about her style. It sort of came to me at a right time to evaluate self, relationships and parenting. As the name suggested, I inhaled deeply until the memorial, exhaled with a short burst during the exit from Serena's home, exhaled with a long, slow finish to empty the lungs until reaching Fiona's home, inhaled, filling with the memories of Jesse and Fiona's connection, held for a moment when Leroy meets Jesse, exhaled slowly and completely at the awesome finish. Totally loved the ending. This is a wonderful, quiet but powerful book, with very rich characterization and an interesting structure. It uses a condensed "day-in-the-life" timeline divided into three parts. The first part is the drive to the funeral that Maggie and Ira attend told from Maggie's POV; the second part the drive home told from Ira's; the third part the coming together of themes and events that occur along the way. I esp. enjoyed how Tyler explores the approach-avoid/love-hate terrain of relationships, where p This is a wonderful, quiet but powerful book, with very rich characterization and an interesting structure. It uses a condensed "day-in-the-life" timeline divided into three parts. The first part is the drive to the funeral that Maggie and Ira attend told from Maggie's POV; the second part the drive home told from Ira's; the third part the coming together of themes and events that occur along the way. I esp. enjoyed how Tyler explores the approach-avoid/love-hate terrain of relationships, where patterns of behaviour and personality quirks are both minor annoyances that are overcome and add strength to the marriage, or fodder for misunderstandings that turn into irreconcilable rifts and split people apart. The two marriages under scrutiny--Maggie's and Ira's mature and solidified; their son Jesse's and daughter-in-law Fiona's immature and currently broken--play off of each other illuminating both character and theme. The "lessons" are in the details, choices and the slow unfolding of events, past present and future, along the way. The journey is as laconic and meandering as the late summer drive--a metaphor for marriage itself. A secondary theme is identity, and here too, there is exquisite poignancy in the revelation of each character's search for self-definition and the conclusions drawn. They search, too, for clarity and insight into what they mean to each other, what their marriage stands for and how the marriage has shaped their 'selves'. Tyler has a unique talent for seamlessly weaving dialogue, characterization and theme together. She creates characters at once idiosyncratic and eccentric, but symbolic of our common humanity, too. It is a careful balancing act that, now that I've dipped back into her œuvre, I remember as emblematic of her writing. It has inspired me to read more of hers, and although I'm pretty sure The Accidental Tourist and this one, which won the Pulitzer, are Tyler in top form, I bet there are some less-well-known gems in there too. Look, maybe my rating is too harsh. Maybe when I'm 50-something, with kids, and am too well-meaning to face actual facts and listen to what people are actually saying before coming to conclusions and jumping to action, and am too intrusively optimistic to tell things truthfully (choosing instead to dress facts up in order to needle people into doing what I think they need to do), and am too indignant to ever admit liability or fault for anything, I will enjoy this book. Until then, 1.5/5 (no half Look, maybe my rating is too harsh. Maybe when I'm 50-something, with kids, and am too well-meaning to face actual facts and listen to what people are actually saying before coming to conclusions and jumping to action, and am too intrusively optimistic to tell things truthfully (choosing instead to dress facts up in order to needle people into doing what I think they need to do), and am too indignant to ever admit liability or fault for anything, I will enjoy this book. "So here she was alone. Well! She brushed a tear from her lashes. She was in trouble with everybody in this house, and she deserved to be; as usual she had acted pushy and meddlesome. And yet it hadn't seemed like meddling while she was doing it. She had simply felt as if the world were the tiniest bit out of focus, the colors not quite within the lines - something like a poorly printed newspaper ad - and if she made the smallest adjustment then everything would settle perfectly into place." Вторая половина книги как-то труднее далась. Очень грустно читать о неблагодарных детях и неизбежном распаде семьи, о невозможности повернуть свою жизнь обратно, чтобы сделать нечто Важное. Боже, а может мне страшно было читать эту книгу, потому что я узнала в её героях себя и своих близких? This won the Pulitzer in 1988. Anne Tyler is one of my favorite authors and this book sums up why. She can take the most ordinary of people on a slightly ordinary day and make it feel like an epic world. The main character, Maggie, is meddling, controlling, and a fudger of the truth — and I loved her. She was completely unable to see reality and move on. Her hope for things remaining the same or for going back to what used to be was sort of hard because haven’t we all been there, yearning for what will never be again. Il romanzo di Anne Tyler, premio Pulitzer nel 1989, descrive la vita coniugale di Maggie e Ira Moran. La storia si snoda nell'arco di una giornata, ma è costellata di digressioni e flash back che educono il lettore sulla vita dei coniugi Moran e sui loro figli. Si respira tanta tristezza in questo romanzo, Maggie, la protagonista, lotta con protervia affinché le cose cambino perché crede nei buoni sentimenti, mentre Ira, il marito neghittoso e disincantato, si esprime attraverso i testi delle ca Il romanzo di Anne Tyler, premio Pulitzer nel 1989, descrive la vita coniugale di Maggie e Ira Moran. La storia si snoda nell'arco di una giornata, ma è costellata di digressioni e flash back che educono il lettore sulla vita dei coniugi Moran e sui loro figli. Si respira tanta tristezza in questo romanzo, Maggie, la protagonista, lotta con protervia affinché le cose cambino perché crede nei buoni sentimenti, mentre Ira, il marito neghittoso e disincantato, si esprime attraverso i testi delle canzoni e per non pensare gioca a solitario . Tutti gli sforzi di Maggie sono tesi a ché Jesse, il primogenito, si riconcili con la ex moglie e la bambina di cui è padre. I coniugi Moran concludono la giornata nella loro abitazione; nel buio della sera una casetta con la luce accesa fra le altre case in un quartiere residenziale di Baltimora: vite tra le vite e le altre sembrano tutte migliori della loro. Lo stile ricorda il minimalismo americano di Cheveer, Carver e Updike: è il silenzio, più che le parole, a prevalere. Nonostante le indubbie qualità della narratrice, la storia ha momenti di tedio profondo punteggiate da infelicità e rimpianti. Leggerlo durante le vacanze di Natale mi ha permesso una riflessione profonda: sono una cinica oppure ho una devastante forma di masochismo? A proposito: la traduttrice ha un problema con gli ausiliari. I haven’t written a review for this book because I’m not exactly sure whether I liked this or not - is that even possible? I read it as part of my Pulitzer Prize challenge. On the one hand I think it was kind of a drag, and went on and on, and other the other hand i think - genius! !